Home Health Science Blood is meant to circulate. Pass it around. Blood donor day is commemorated to fulfill the need of blood transfusion, motivate people worldwide to thank blood donors for their selfless initiative and promote voluntary, safe and unpaid blood donations. June 14 is celebrated every year as World Blood Donor Day since 1868 on the day of the birth anniversary of Karl Landsteiner with different themes. In 2018, the theme for this day is “Blood connects us all” and the host country is Greece. Any other condition that causes a chronic loss of red blood cells or platelets. Early diagnosis and treatment of anemia and conditions cause anemia. Also, read Blood components and its function. Blood transfusion should not go wrong because it may carry the risk of transfusion-transmissible infections, including HIV, hepatitis viruses, syphilis, malaria and Chagas disease. Blood is sometimes transfused unnecessarily which exposed to risk and no benefits to a patient. Heart health: Donating blood improves overall cardiovascular health. It reduces the chances of getting a heart attack by 88 percent and the risk of severe cardiovascular events by 33 percent. Burns calories: It helps to improve physical health. Donating one point blood (450ml) burns 650 calories. 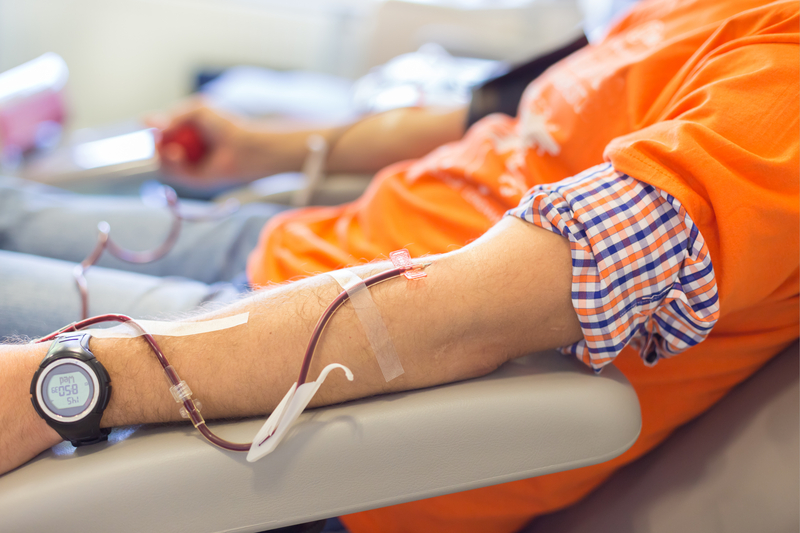 People feel more energized after regular blood donation. Reduces cancer risk: Blood donation oftentimes reduces risks associated with liver, lung, colon, stomach and throat cancers. Good for Liver: Blood donation helps in maintaining the iron levels and reduces the risk of various health ailments. Reduced risk of Hemochromatosis: Regular blood donation may help in reducing iron overload. Enhances the production of new blood cells: It is the reason chiefly informed to a donor. At the time blood is withdrawn, the body immediately begins to replenish the lost blood. Novel red blood cells are produced by bone marrow within 48 hours of donation and all the lost ones during donation are replaced within two or three months. It helps to stay healthy and efficient. Blood donation always helpful and medically recommended for donor’s good health. Your simple alms-deed can give a second life to someone. This hope for someone brings joy to many and can connect us all.